ABUJA – A chieftain of the ruling All Progressives Congress APC in Edo state, Duke Edobor Oshodin has frowned at the constant attacks on the National Chairman of the party, Chief John Odigie-Oyegun by elements of the immediate-past administration of Gov. Adams Oshiomhole, describing the trend as senseless and selfish. Noting that the attacks were sponsored and ill-motivated, Oshodin specifically berated one Charles Idahosa, a former Special Adviser on Political Matters under Gov. Oshiomhole for being ridiculous to have queried the loyalty of the chairman to President Muhammadu Buhari. “If Mr. Idahosa says it is wrong for Chief Odigie-Oyegun to be loyal to the president, then it is inconsistent for him to make himself a puppet to a godfather”, said Oshodin. According to him; “Mr. Idahosa served as Special Adviser on Political Matters under the immediate-past governor of Edo State, Comrade Adams Oshiomhole. In his thinking, it is wrong for Chief Odigie-Oyegun to be loyal to the President since it was not the President who made him Chairman of the Party — he has his own idea of the single individual who achieved this feat! One may ask, who should the APC National Chairman be loyal to? Well, Chief Odigie-Oyegun previously answered the question on his emergence as APC National Chairman, saying: ‘Everybody assisted me to this position and I’m grateful to all of them… I don’t believe one particular person solely assisted me to this position”. Oshodin added that; “Mr. Idahosa would rather have a National Chairman who is inflexible in his approach to managing contending party interests, issues, differences within the party, even if this means working against the interests of the President. “Clearly, Mr. Idahosa has lost sight of how the APC was formed in 2013. To refresh his memory, the APC was an amalgam of vibrant opposition parties that came together with the objective of upstaging the failed government of the Peoples Democratic Party PDP. However, while the APC won the Presidential election and the majority of governorship and legislative positions in the country, the powerful groups that coalesced into APC did not drop their respective interests. “To his credit, the APC National Chairman has been able to moderate and referee the forces at play within the APC with a sense of balance, which is probably the single and most crucial factor that has kept the APC united, despite the well-reported power tussles and wrangling that have cropped up within the party. “Any right-thinking person would know that decisions like the appointment/election of the party chair and other party executives require the consensus of party leaders and consent of the majority of voters to be successful. 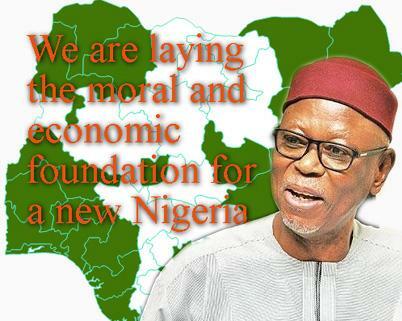 Chief Odigie-Oyegun emerged as APC National Chairman through the collective efforts of a coalition of individuals and interests within the APC fold at the time. However, Mr. Idahosa even claims to have personally ensured Odigie-Oyegun’s emergence as APC National Chairman. It is left to members of the party who were witnesses to the events of the time to reach their conclusions”, he added.